On Monday night, I took one for the team and watched the Pacers-Magic game while all of you watched the Heat take a two-game series lead on the Knicks. The next day, I filled you in on what you missed in what I described as the least-interesting first-round series in this year’s playoffs. Since I apparently upset somebody at Grantland headquarters, I was asked to do a similar thing with Wednesday night’s games. More specifically, I was asked to watch Game 2 of the Spurs-Jazz series — which I considered to be the second-least-interesting first-round series — and update those of you who instead watched Season 37 of American Idol. Well, after watching Game 2 on Wednesday, I have to say that I was way off in claiming that the San Antonio–Utah series is the second-least-interesting series in the first round. That’s because after the Spurs ballooned their lead to as many as 38 points in the fourth quarter, the Jazz, in one of the most probable endings in NBA playoff history, came storming back to cut the lead to 31 before the final buzzer sounded. So yeah, the game was painfully boring and at halftime I seriously considered switching it over to Fox so I could watch Randy Jackson, that chick who wears too much makeup, and Jennifer Lopez try to pretend that the people singing in front of them are going to be relevant in five years. But alas, I stuck with the game until the end. Here were four things I noticed that didn’t completely bore me. The Jazz have the best uniforms in the NBA. Since there’s nothing really positive to say about the Jazz’s performance, I’ll just take a second and say that the way the Jazz give a new-school feel to an old-school style makes their uniforms the best in the league. This is why, as a bandwagon Pacers fan, I want nothing more than for the new-look campaign started by Ben Phillippe to become a reality. The origin of Mike Fratello’s nickname is a colossal disappointment. At some point during the second half, Fratello, who was calling the game on TNT, was referred to by his nickname, “The Czar.” Now, I’ve been aware of his nickname for years, to the point that I can’t remember a time when he wasn’t referred to as “The Czar.” But when he was called by his nickname Wednesday night, I realized I had no idea what the origins of the name were. I had always assumed that a nickname as badass as “The Czar” must’ve come from him either being a direct descendant of Ivan the Terrible or having a reputation as a fiery coach who wouldn’t hesitate to drink blood out of his players’ skulls if they kept screwing up. Since I was looking for any excuse to not keep watching the ongoing blowout, I decided to browse the Internet and get an answer. Unfortunately, that answer was an enormous letdown. That’s because his nickname comes from Marv Albert referring to him as “The Czar of the Telestrator” early on in his broadcasting career, because of how good he was at explaining plays on screen. Needless to say, I immediately went from thinking he has one of the most badass nicknames in NBA history to thinking that he has quite possibly the lamest nickname I’ve ever heard. Now I’ve got my fingers crossed that I never find out that Bryant “Big Country” Reeves’s full nickname is “Big Country Music Fan” or something. The Domino’s commercial that tries to get you to download their Pizza Hero app is the best. Gregg Popovich is some sort of wizard. 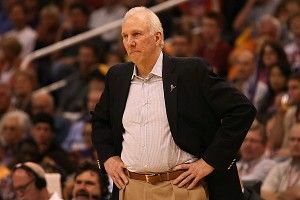 Before the game, Popovich was presented with the NBA’s Coach of the Year trophy, and shortly thereafter he proved why he deserved it. I’ve always kind of ignored the Spurs because nothing about them is interesting — they play a boring brand of basketball (which is to say that they play the game the way it’s supposed to be played); they are in a small market more than 1,000 miles from my hometown; and the best player in the history of their franchise is known for knocking down 5-foot bank shots. Hell, even their colors — black, white, and gray — are boring. But after watching them dismantle the Jazz on Wednesday night, I now understand what the fuss is about. I’m not going to get carried away and say that I’ll willingly watch more of their games or anything, but at least now I see why Popovich gets so much credit. I mean, it’s nothing short of a miracle for the Spurs to finish with the best record in the Western Conference and be well on their way to a first-round sweep while starting a 36-year-old (Tim Duncan), a 20-year-old rookie (Kawhi Leonard), a guy who has been waived twice in his three-year NBA career (Danny Green), and a guy who has replaced Eddy Curry as the no. 1 fat joke target in the NBA and only averaged seven points per game for the worst team in NBA history (Boris Diaw). Plus, Popovich is doing this with two starters (Diaw and Tony Parker) who are French. And as if all of that weren’t enough, did you know that if you rearrange the letters in Gre Popovi, you can spell out “poop giver?” True story.